I've been playing around investigating sampling thresholds with statistics updates on SQL Server (2012) and noticed some curious behaviour. Basically the number of rows sampled seems to vary under some circumstances - even with the same set of data. When I look at the output of the SHOW_STATISTICS I'm finding that the "Rows Sampled" varies with each full execution (i.e. the table gets dropped, recreated and repopulated). My expectation was that this figure would be the same each time as the table is identical. By the way, I don't get this behaviour if I just delete the data and re-insert it. It's not a critical question, but I'd be interested in understanding what's going on. You can collect this statement with Extended Events or Profiler (SP:StmtCompleted). Statistics generation queries often access the base table (rather than a nonclustered index) to avoid the clustering of values that naturally occurs on nonclustered index pages. 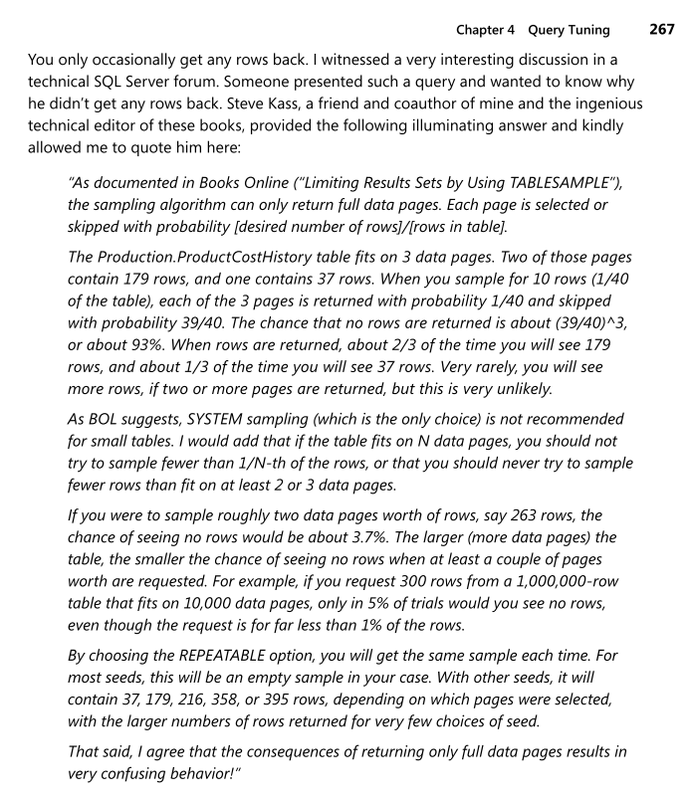 The number of rows sampled depends on the number of whole pages selected for sampling. Each page of the table is either selected or it is not. All rows on selected pages contribute to the statistics. The low integer part of the (bigint) base table's partition_id e.g. For sampled UPDATE STATISTICS, the REPEATABLE value is 1.
where memory at [rcx+30h] contains the low 32 bits of the partition id and memory at [rcx+2Ch] contains the REPEATABLE value in use. ...multiplies the seed by 41A7 hex (16807 decimal = 75) as shown in the equation above. Later random numbers (for individual pages) are generated using the same basic code inlined into sqlmin!UnOrderPageScanner::SetupSubScanner. One consequence of using the MINSTD Lehmer random number generator is that seed values zero and int.max should not be used as this will result in the algorithm producing a sequence of zeroes (selecting every page). The code detects zero, and uses a value from the system 'clock' as the seed in that case. It does not do the same if the seed is int.max (0x7FFFFFFF = 231 - 1). That will select every row on every page whatever the TABLESAMPLE clause says (even zero percent). This is an excellent question! I'll start with what I know for sure and then move onto speculation. Lots of details about this in my blog post here. Sampled stats updates use TABLESAMPLE behind the scenes. It's pretty easy to find documentation about that online. However, I believe it's not well known that the rows returned by TABLESAMPLE partially depend on the hobt_id of the object. When you drop and recreate the object you get a new hobt_id so the rows returned by random sampling are different. If you delete and reinsert the data the hobt_id stays the same. As long as the data is laid out in the same way on disk (an allocation order scan returns the same results in the same order) then the sampled data should not change. As to why that happens, I believe it's because SQL Server scans the clustered index instead of the nonclustered index when gathering sampled stats on an index. I also think that there's a hidden (to those of us tracing the hidden stats update queries) value for REPEATABLE used with TABLESAMPLE. I haven't proven any of that, but it explains why your histogram and the rows sampled changes with a rebuild of the clustered index. See also Sampling Using TABLESAMPLE by Roji. P. Thomas.